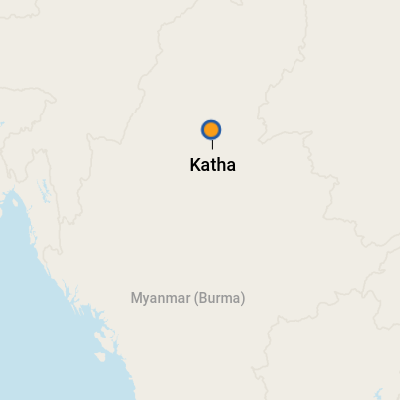 Katha is located at the northern end of the Irrawaddy River. Passengers who stop here visit the village's large and chaotic market, which is within walking distance of where the river cruise ship ties up. Here, merchants peddle fresh meats, fish, spices and flowers, along with dishes, pottery and other sundries. Residents shop the market twice a day so they have fresh ingredients for meals, but tourists can find handcrafted souvenirs at great prices. Watching locals barter, slice fish and create staples like fish paste is a sight not to be missed. A visit to Katha might also include a journey to a nearby elephant camp, about a 30-minute drive from the town. Baby elephants, their nursing mothers and elephants retired from teak logging live here, along with their "oozies" (handlers who spend their lives with the elephants, often from the time they are young boys). The currency in Katha is the kyat. The language in Katha is Burmese.